It is a form of arthritis that affects the cartilage in the ball and socket joint. Cartilage degradation causes joint malfunction. The associated cartilage is called hyaline articular cartilage. Wear and tear of the cartilage exposes the bone beneath. This results in grinding of the bones when the shoulder is moved. It is obvious that the lost cartilage cannot be retrieved back. However, steps can be taken to regain the range of motion. The problem of stiffness and pain can also solved through the use of adequate medicines. They generally include pain killers. Osteoarthritis and rheumatoid arthritis are two forms of shoulder arthritis. Another kind of shoulder arthritis is the post-traumatic arthritis. It may be due to an accident or repeated trauma. These three categories destroy the cartilage. The main symptoms include stiffness, pain etc. The individual also finds it difficult to sleep on the affected shoulder. The pain worsens progressively. The pain can be categorized into three according to the affected area. If it is affected in the glenohumeral shoulder, the pain will be in the back of the shoulder. This pain may increase with weather changes. The patient will feel a deep pain in the joint. 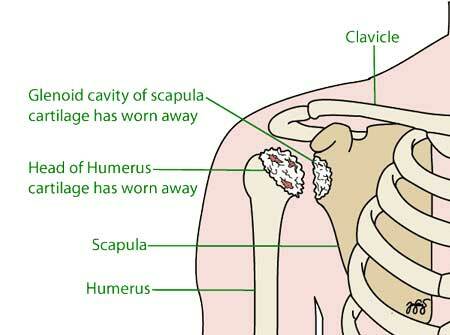 If the glenohumeral and acromioclavicular are affected, the patient will have a pain throughout the shoulder. This may be due to rheumatoid arthritis. When the arcomioclavicular is affected, the pain will be focused on the top of the shoulder. It may sometimes spread towards the sides of the neck. Stiffness or limited range of motion is considered to be one of the most common symptoms. The patient may feel difficulty while trying to lift the arm. There may be a clicking, grinding or a snapping sound when the patient moves his/her shoulder. The diagnosis of shoulder arthritis is simple. The doctor can find it out by examining your symptoms. But, the doctor may also suggest for an x-ray or MRI to conform it. One of the most prevalent and successful treatment for shoulder arthritis is cryotherapy. As indicated by the name, it involves cooling the area to a much lower temperature. This treatment is to get relief from the pain by reducing the skin temperature. It helps to keep the affected area cool. Medicines such as glucosamine sulfate are considered to be a preserver of the cartilage. If the pain and other symptoms of shoulder arthritis is not relived with the non-surgical treatments, it is advisable to seek surgical treatments. There are different kinds of surgeries such as shoulder joint replacement anthroplasty , arthroscopy, 'ream and run' (humeralhemiarthroplasty with non prosthetic glenoid arthroplasty , and reverse (Delta) total shoulder joint replacement arthroplasty. Surgical treatments are usually effective. It helps to reduce pain and stiffness in the affected area. The period of recovery may vary according to the type of surgery that the patient has undergone. There can be certain complications and risks after the surgery. It may include damage to nerves or blood vessels, infection, blood clots and excessive bleeding. Before the surgery, the doctor will explain the possible risks and complications with the patient. The severity and the site of pain. About the swelling around the joints. Other things related to the health condition. Flexibility or the motion of the joints. X-rays: it can visualize bone using low level of radiation. It can show bone spurs, bone damage and cartilage loss. But, it is not useful in the early stages of arthritis. It can be used to find out the progression of disease. CT scan (computerized tomography): The scanners take x-rays from different points. This helps to have a mixed view points of the internal parts. It helps to project both the surrounding soft tissues and bone. MRI (magnetic resonance imaging): it can project detailed images of ligaments, cartilages and tendons. Ultrasound: it uses high-frequency sound waves to project the images of cartilages and internal structures. Sometimes, the doctor may suggest for a test called arthroscopy. It is done by inserting a flexible tube (arthroscope) though a cut near to the joint. The flexible tube transfers the picture inside the joint to a screen. It is also known as keyhole surgery. The main advantage of arthroscopy is that, it does not need the joint to be opened fully. For knee arthroscopy, only two small cut are enough. Arthroscopy consumes less time for recovery and the level of success can increase. It is mainly useful for athletes and such professionals, who get knee injuries frequently. The knee arthroscopy is very common nowadays. After the surgery, there will be swelling around the concerned area. The swelling will be settled in within the period of 7-15 days. Extensive exercise and walking are denied before the complete settlement of swelling. This surgical procedure helps the doctor to have a clear view of the affected area or the joint. A coin has two sides. Likewise, arthroscopy has certain complications also. It includes anesthetic complications and operative complications. Anesthetic complications are rare. It may cause problems such as chest infection, inability to pass urine, nausea, constipation and heart complications. There is only less than 1% of chance to get operative complications.